IN 1952, FOURTEEN peasants, owning little more than a few religious pamphlets, whiling away their lives on the collective farms that had starved millions of their fellow Ukrainians, were arrested by the Soviet police and sentenced to the Gulag. As Hiroaki Kuromiya explains, it was their religiosity that posed the threat defined by the Soviet authorities. These peasants were Reformed Seventh-Day Adventists who refused to see Soviet law as the only law, and did not find paradise on this Earth. Marxism, of course, was in competition with religion. Soviet authorities had been surprised in 1937 by census data showing that their revolution had not supplanted religiosity. Stalin made arrangements with Russian Orthodoxy, which became the Soviet house religion. This only made the devotion of the smaller Protestant denominations, such as Seventh-Day Adventists, seem more authentic; but these, too, were generally captured by the state. The Reformed Seventh-Day Adventists were the ones who refused to compromise. They declined to work on Saturday, and they refused in principle to take up arms (although some of them had served in the Red Army, a fact that would be suppressed at their trial). Yet these fourteen wretchedly poor Ukrainians did not pose anything like a threat to the state, at least not as we would ordinarily view matters. They were not an organization, they had no connections, they had not broken any laws. Kuromiya’s study of the interrogation protocols and judicial filings in the case made against them exposes the very special understanding of law under Stalin. Whereas we might see law as the architecture of society, under Stalinism law was a battering ram. It did not permit a predictable life for Soviet citizens; instead it opened investigations, interrogations, and souls. The law was a tool for the baring of human relations so that improper ones might be stigmatized and corrected. Soviet law in the Stalinist period could not apprehend individual purposes or presume individual innocence, because individuality in our liberal sense of the term was not recognized. Any appearance of what might seem to be individual initiative or private religious experience was simply evidence of a conspiracy, which must involve a larger group with a common purpose. Within this worldview personal motives did not matter, since people acted only within groups, whose significance could be understood only against the larger historical setting, which was of course nothing less than the determined assault of the reactionary imperialist powers against the Soviet homeland of socialism. Interior life existed in the Soviet Union, according to Kuromiya, but it had no simple reflection in political behavior: apparent acts of politics, if they are observable by us in the sources, were also observable to the Soviet police at the time, and were immediately penetrated. Anything visible above the flat landscape of Soviet monotony is, despite our wishful thinking, there to preserve that monotony. Thus the fourteen defendants are there in the records for us to contemplate not because they were heroic resisters or articulate dissidents, but because their Bible circles included agents of the secret police: an Adventist pastor who had accepted the legitimacy of Soviet rule, and a seeming firebrand who preached strict adherence to the Saturday Sabbath and to pacifism. The police agents began the case, which the interrogators (probably using torture) continued. The defendants all eventually signed self-incriminating confessions, although several of them were illiterate, using the stilted language of their persecutors (“anti-Soviet activities”). The confessions in such interrogations were not exactly dictated by the police, but rather incorporated certain details extracted during interrogation into a general template. The confessions would be seen by anyone who believes in due process as not only outrageous but also as unproductive of truth or understanding. They are full of obvious mistakes. But this was not a problem for Soviet justice, whose presumption was that anyone being tried was part of a larger plot. Any apparent contradiction was simply a result of the complexity of the conspiracy and of the attempts to cover it up. Kuromiya’s masterly micro-history shines a bit of light into a dark Soviet reality, while clarifying just how much care we must take with Soviet documentation. More broadly, his work is a warning about the flexibility of law itself in a world so easily defined as exceptional. In all societies the question must arise, as it does in different ways in the four books considered here, about the applicability of law to exceptional situations, when the state itself seems to be in danger. Stalinism’s answer is worth recalling as a historical reference point for present debates: that life is a permanent struggle between an inherently virtuous homeland and implacable foreign enemies, and so politics is an unending state of emergency; and that no morality extends beyond the protection of the government as it exists, and law has no purpose beyond the instrumental one of protecting that government—and sustaining that sense of emergency. SEVENTH-DAY Adventism was originally an American religion, which in the Soviet Union enjoyed a revival under the German occupation of Soviet Ukraine during the Second World War. Thus the prosecution of these fourteen Ukrainians had to be seen, from the Soviet perspective, as an element of the Cold War. In 1952, belonging to an American religion in the Soviet Union was dangerous; and yet not so long before, in 1945, the Soviet Union was the most important American ally in the common struggle against Nazi Germany. The Red Army liberated the entire East European region where the Germans committed their worst atrocities. As the Soviets liberated the sites of the death pits, and the starvation camps, and the death facilities at Majdanek, Treblinka, Bełżec, Sobibór, Chełmno, and Auschwitz, Americans were shocked by the murder of American pilots in German towns and by the execution of about eighty-four American prisoners by the Waffen-SS at Malmédy. A powerful yet still incomplete sense of the scale of German atrocity arrived with the American liberation of some of the German concentration camps, such as Dachau and Mauthausen. These dreadful facilities were not the sites of the major German killing policies such as the Holocaust. Understandably, the Americans who liberated their survivors could not easily imagine that there were worse facilities farther to the east. The American investigation of Mauthausen concluded that it was an “extermination camp” like Treblinka, which it was not. A mistake that haunts us still begins there. The American conflation of our own power with the undoing of Nazi evil began with the liberation of these camps and continues to the present. The subject of Tomaz Jardim’s fine book, like Kuromiya’s, is a single trial: that of the personnel at Mauthausen before an American military commission sitting at Dachau. The military commission tried sixty-one members of the staff of the Mauthausen concentration camp, and found all of them guilty. On May 27, 1947, forty-nine of the convicted were hanged, at seven-minute intervals, in the largest execution ever arranged by American organs of justice. As Jardim notes, this was only the most dramatic of the 462 trials held before American military commissions at Dachau. Although we tend to remember the special international tribunal at Nuremberg, which tried some members of the Nazi leadership, Dachau was the more important, and the more typical, site of American military justice. Some ninety percent of the American prosecutions took place at Dachau, all before military commissions. At first glance everything about the American prosecution of the camp personnel of Mauthausen is different from the Soviet prosecution of Soviet pacifists. At Dachau religious dissenters were not on trial for their pacifism; instead their persecutors were being judged for war crimes. Reformed Seventh-Day Adventists had opposed bearing arms for Nazi Germany just as they had opposed bearing arms for the Soviet Union, and so some of them had been sentenced to camps. (Mainline Seventh-Day Adventists, as opposed to the small splinter Reform group, made compromises with both Nazi Germany and the Soviet Union.) Reformed Seventh-Day Adventists were among the 200,000 prisoners in Mauthausen, about half of whom died or were killed; about a quarter of those killed were Jews. The personnel at Mauthausen were quite clearly guilty of an enormous atrocity, even if contemporary legal terminology was not quite adequate to cover the death of a hundred thousand people in a concentration camp. Whereas Soviet interrogators in Ukraine were simply doing their job as they did it every day, the American prosecutors found themselves in an extraordinary and unknown situation, for which their professional and personal experiences provided few points of reference. Yet to read Jardim’s book immediately after Kuromiya’s is unnervingly like the vertigo of learning the results of the notorious Stanford Prison Experiment, in which normal students quickly became thugs when the circumstances were altered. The Americans at Dachau, confronted with a momentary judicial emergency, quickly adopted judicial techniques that eerily resembled the everyday practice of the Soviets. The Mauthausen defendants were tried as a group rather than as individuals. They were presumed guilty rather than innocent, on the basis of the new legal doctrine of “common design.” It, like the Soviet presumption of conspiracy, was circular: any evidence provided by individual defendants established the common design, and the common design meant that all of the individual defendants were guilty. The American interrogators manipulated and abused some of the Germans, forcing some of them to strip naked or to wear black hoods. As Jardim tactfully puts it, “interrogation strategies were left largely to the discretion of the interrogator.” Like the Soviet peasants, the German prisoners signed confessions that were implausible in details and that included language they themselves would not have used. Just as the Soviet defendants supposedly spoke of their “anti-Soviet” activities, the Germans supposedly called Mauthausen an “extermination camp,” an erroneous American usage. The confessions produced by American interrogators, like the Soviet ones, were conspicuously similar from one suspect to the next. In chambers the judges spent on average less than a minute considering the case against an individual defendant, and all of the accused were found guilty: the American prosecutor had a 100percent conviction rate, not just in this trial but in every single case he brought. Those convicted in the Mauthausen trial at Dachau were, as Jardim writes, “incontestably guilty.” As he notes, such trials before American military commissions had the virtue of expediency—a large number of men were hanged very quickly. Jardim emphasizes the crucial role played by survivors of Mauthausen in the prosecution of their former oppressors: one of them preserved the record of many of the killings; another was the young Simon Wiesenthal. But Jardim concludes that the court’s vision of what happened at Mauthausen “not only lacked depth but lacked the means by which to convey a pedagogical lesson.” Since the accused were “denied ... a full and fair trial,” they were easier for other Germans to forgive and to embrace. The techniques employed by the military commissions were, inevitably, subject to criticism not only in Germany but also in the United States. The picture is thus a mixed one: Jardim believes that justice was delivered, and suggests quite plausibly that if more time had been allowed to pass, the executed men would have escaped with their lives. As he notes, with admirable equanimity and balance, these were trials that arose in the unusual circumstances of the transition between war and peace. Is the history of the Mauthausen trial a closed chapter, or a relevant precedent? As Jardim notes at the very end of his book, military commissions are what we use now to prosecute some of the terrorists associated with Al Qaeda, such as Khalid Sheikh Mohammed, whose trial began on May 5. THIS IS AN altogether excellent development, argues William Shawcross, in a passionate book that draws a bold line between World War II and the current prosecution of Khalid Sheikh Mohammed. Rather than exposing delicate American readers to anything like the historical truth about our own history of military justice, Shawcross gives us what we want to hear. The American military is “the greatest defender of human rights that the world has ever seen,” and so on. Back in the good old days of the 1940s, says Shawcross, before the annoying emergence of human rights organizations, loyal Americans understood that their inherent goodness was enough to protect them and the world. All we need to know about that period is that the Nazis were evil, and all we need to know to connect our era to that one is that Al Qaeda is evil, too. Nuremberg, says Shawcross, teaches us that military commissions were good enough for the Nazis, and so they are good enough for Al Qaeda as well. There are logical holes here through which a drunken landlubber could sail the Sixth Fleet. We liberated part of Europe, but not the part that most needed liberating; that job was done by the Red Army, and in that zone one dictatorship was replaced by another. Our habit of overestimating the degree of liberation we brought to Europe is encouraged here, surely deliberately. 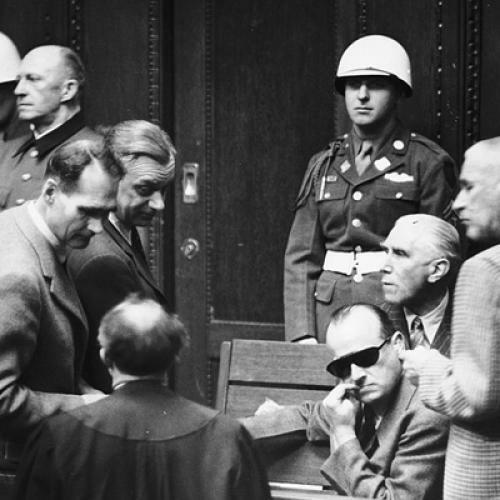 Nuremberg, as Shawcross knows (his father was the lead British prosecutor), was a special international tribunal organized by the Allies generally; the closer precedent for American military commissions is not Nuremberg but Dachau, where we have more than four hundred examples, including the Mauthausen case, of how American military commissions have functioned. In other words, Shawcross fails to mention the American military commissions in a book about American military commissions. The good old days of the 1940s were not as lawless as Shawcross would have us believe; they included the Geneva Conventions and the laws of war generally, and plenty of rambunctious American citizens concerned about defending them. The American military commissions of the Dachau era, like those of today’s Guantanamo era, generated much public discussion and criticism in the United States. When someone tells you what you want to hear, it is because he is trying to get his hands in your pockets. What Shawcross wants to rob from us is the traditional American respect for the rule of law. Both Jardim and Kuromiya assume that their readers endorse the rule of law, and seek to show how it can be altered by a sense of permanent or temporary emergency. They acknowledge what we all must: the unavoidable tension within legitimate systems when emergencies arise. Shawcross, by contrast, wants to convince us that we inhabit a permanent state of exception. Much is odd about the way he makes the case, not least the way in which Shawcross the respectable reporter keeps getting in the way of Shawcross the aficionado of military commissions. Reading his book, we learn that, in the eleven years since September 11, military commissions have been a dilatory headache, while the civilian courts have put away one terrorist after another. Shawcross’s case is not really that military commissions work, or even that they can do something that civilian courts cannot. He just seems to want them front and center, as an American symbol, during what he sees as an endless American War on Terror. Though the centerpiece of the War on Terror was the war in Iraq, Shawcross wants to keep it from the center of his story. The actual war in Iraq, as Shawcross the reporter admits, was a magnet for Al Qaeda. But Shawcross the reporter quickly gets drowned out. This is not an authoritative book, but an authoritarian one: the only kind of liberty to be found here is the one Shawcross takes with the facts. September 11 is like the Holocaust, even if its death toll is far smaller than that of the murdered Jews of Kovel or Lutsk or Rivne or any number of Ukrainian shtetlach of which you have probably never heard—in sum, about one-two thousandth of the Holocaust. The “Europeans will continue to leave the disagreeable and costly parts of the defense of the West to the United States,” claims Shawcross, and follows this up in the next sentence with typically nasty innuendo: “As we have seen, German, British, and European jihadists training in secret camps were amongst the targets of U.S. drones in 2010 and 2011.” Yes, and so were American jihadists. In Shawcross’s account, American jihadists are the fault of Islam, whereas European jihadists are the fault of Europe. When Europeans do not want to hold terrorists in their big cities they are cowards, but when Americans do not want to try them in New York they are righteously angry. Let us not forget that Khalid Sheikh Mohammed graduated from an American university; that the September 11 terrorists, whom he led, trained for months in the United States; and that September 11 happened where and when it did because we, not the Germans or the British or the Europeans, were the soft underbelly of the West. September 11 is a story of shocking malice, but also of shocking incompetence, and it would ill become us to cover up our own failures with bellicosity directed against our friends and allies. Terrorism in Shawcross’s book is Muslim, even though terrorist attacks on American soil are most often planned and carried out by Americans, as we have had cause this summer to remember. Should the American right-wing terrorists Timothy McVeigh and Eric Rudolph have been brought before military commissions? Should members of the American sovereign citizen movement be subject to military commissions when they shoot police officers? After all, they deny the legitimacy of American law, which is one of the reasons Shawcross gives for denying other terrorists recourse to normal courts. The answer is, of course not, because American law should not compromise with its enemies but should instead defend itself against them. Military commissions will sometimes be necessary, but should always be justified on a particular basis, rather than sanctioned by a dogmatic sense of the presence of evil. We have allowed Al Qaeda to enter our minds, and the only way back to ourselves is to follow our own procedures and to take them seriously. Al Qaeda wanted a war, and we dignified their crime by giving our response the same name. Those captured want martyrdom from military commissions, rather than life sentences from civilian justice, and we have trouble again not giving them what they want. In a typically vague and slightly sinister passage, Shawcross writes that the “U.S. must be seen to abide by its values. But how far the U.S. should tailor its national security policy to the perceptions of the world beyond the oceans is a continuing argument.” But it is not important to be seen to be abiding by our values. It is important to abide by our values. Our values are not our perceptions of other people’s perceptions; our values are what we ourselves believe to be good. And a central value of American life is the rule of law. Nowhere does Shawcross notice that American critics of American military commissions are defending an American tradition. “Nuremberg,” writes Shawcross, “is a precedent on which the United States can build with pride.” It is indeed, but it is not the historical example of postwar American military commissions; that, as Jardim shows, was Dachau. Shawcross’s understanding of precedent is a curious one. Even if Nuremberg were the relevant precedent for his case, which it is not, precedent is something that is followed and developed, not something that you can simply invoke and interpret at your pleasure. Shawcross relies on a kind of jurisprudential séance, summoning the spirit of the chief American judge at Nuremberg and claiming that he would agree with Shawcross. One never quite knows what to make of these kinds of arguments, and fortunately there is really no need to make anything of them at all. Another interesting difference between Shawcross and Scheffer resides in the treatment of complexity. Shawcross takes the authoritarian approach: since counterterrorism is complex, the critics do not know what they are talking about, and we should all defer to the wisdom of the Republican big boys. Scheffer, by contrast, offers an impressively gripping and persuasive story of the complexity of his own undertakings: the cooperation across bureaucracies domestic and international, the development of law respectfully and creatively, and the furious indifference of circumstance to the best of intentions. In other words, he has written a good book of contemporary history. In Scheffer’s account, the human rights organizations figure as important mobilizers of support for international law, which is perhaps why they loom so darkly in Shawcross’s book. The Pentagon appears as the most potent opponent of the creation of an International Criminal Court. Although Scheffer has to hunt for money for his tribunals all the time, the finances are the least complicated part of his story: all five of the tribunals taken together from the moment of their establishment to today have cost about as much as two weeks of our occupation of Iraq. The notion that terrorist suspects should be denied the full range of due process rights that are granted to indicted war criminals before the tribunals perversely elevates them to some higher level of evil, as if that were possible, and only makes sense if the intent is to deprive them of a fair trial. But I would challenge any advocate of such a policy to stand before the families of the victims of the Rwandan and Srebrenican genocides, the mutilated masses of Sierra Leone, practically the entire population of Cambodia decades following the deaths of 1.7 million citizens there during the Pol Pot era, the victims of ethnic cleansing in Darfur, the women raped en masse in the Central African Republic, the millions whose kin have perished in the Democratic Republic of the Congo, and the slave children of the Lord’s Resistance Army in Uganda, and then pronounce that the terrorists represent some greater evil requiring a novel regime of law that retreats from due process and humane treatment. Timothy Snyder is Housum Professor of History at Yale University and the author of Bloodlands: Europe Between Hitler and Stalin (Basic Books). This article appeared in the September 13, 2012 issue of the magazine.